Netzach Yehuda battalion surrounds the hideout of the wanted Hamas terrorist during the raid, has aided in over 300 terrorist arrests. Hareidi soldiers from the Netzach Yehuda Battalion - part of the Nahal Hareidi unit - were vital to the IDF's raid on a wanted Hamas terror cell in Jenin on Saturday night. The unit was instrumental in surrounding the house where Hamza Abu Alheja, 20, a member of the Hamas military wing, was hiding. An Islamic Jihad terrorist and a Palestinian Arab civilian from the Palestinian Authority were also killed in the clashes, which erupted after Jenin residents rioted against IDF soldiers; two SWAT members were injured during the operation. Netzach Yehuda oversees a large swath of Palestinian Authority-controlled territory, including the Jenin area. This is not the first time the hareidi unit has been instrumental in a crucial IDF raid. The Nahal Haredi Foundation noted that last year the battalion was responsible for nearly 300 arrests in Jenin and Tulkarm, and helped wound 14 terrorists rioting against IDF soldiers - the highest record in the infantry and paratroop battalions. Nahal Hareidi has won several prizes over the past several months. In December, the unit won the IDF Chief of Staff's prize; the unit was also awarded the IDF Department of Technology and Logistics' Award and the GOC Army Headquarters Safety Award. The unit was also nominated for the Education Award, along with an award in Excellence in Maintaining Sector Security, issued by the Paratroop Command and Chief Infantry Officer. 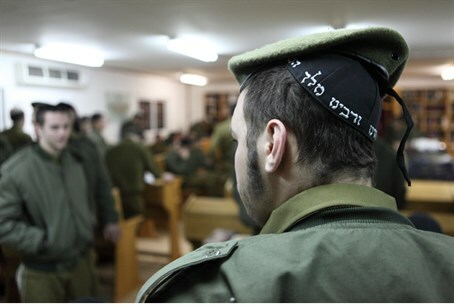 The unit's success has prompted the Nahal Haredi Foundation, which was part of the establishment of the regiment and the idea to have rabbis accompany the troops during service, to work toward opening more service tracks tailor-made for haredi soldiers in elite units in the IDF. 170 soldiers were sworn in to the unit earlier this month - and the number is expected to grow.